I was born during World War II (in December 1944) in the Green Room of The Old House, 25 High Street, Harston where my grandparents lived. I have an elder sister, Doreen (known as Dee). 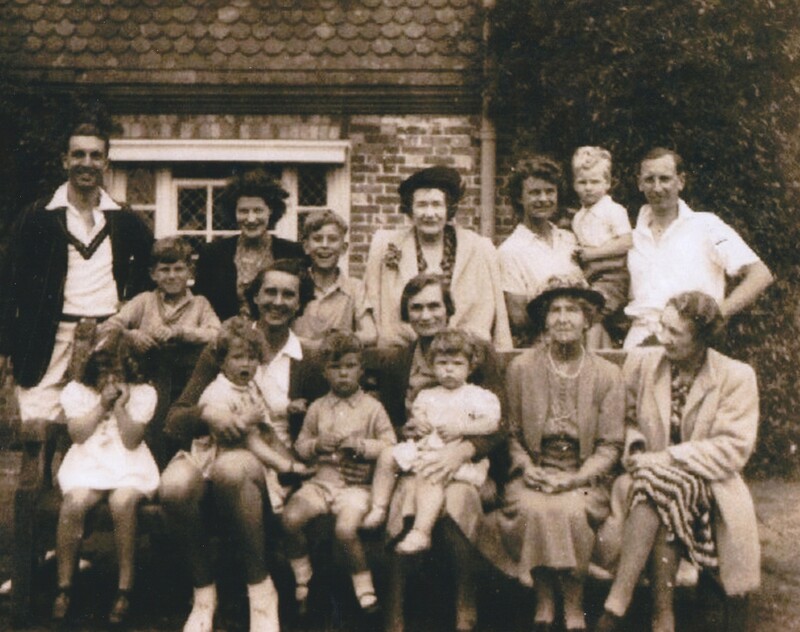 As our father, John Brian Holman Bisseker (known as Brian) – a Captain in the Royal Marines – was away, his wife Josephine (known as Cherry) lived temporarily at The Old House with his parents. The owners of The Old House were Rev. Harry Bisseker (known by his grandchildren as WG) and his wife Mrs. Marian Doris Bisseker (known as Doris and by her grandchildren as Gansie). They had three children, Marian Ray (known as Ray), John Brian Holman and Edith Mary (known as Bunty, as I understood she was a great organiser, as Bunty was in a book called Bunty Pulls the Strings). When Harry retired they moved to The Old House, Harston. When there were large family gatherings at The Old House my cousins, sister and brother and I had tremendous fun playing in the house and in the garden around The Old House. Gansie sometimes told us not to disturb WG in his study when he was writing Christian books or preparing sermons. I also remember WG sitting in his armchair in his study playing patience to relax. The walls of his study were covered in books on book shelves. WG used to have his regular daily constitutional walk, twice a day, smartly dressed and taking his walking stick. When they first moved to Harston, Gansie (Doris Bisseker) asked the local vicar for a list of people who needed visiting and she went around doing so, usually on her bicycle. She had to be back for meals with Harry, who liked them to be at the same times every day. Gansie used to read to the blind and really do anything to help people in need. I remember going with Gansie to visit some people in need in the village. One elderly lady whom Gansie visited was called Miss Samuel. I understood Miss Samuel had worked as a nurse, but when my brother and I visited her with Gansie, I remember how tiny she was and I assume she suffered from curvature of the spine as she was really badly bent over She who had devoted her working life to nursing others in need was, in her old age, in need of help, and Gansie was pleased to do whatever was necessary to make Miss Samuel more comfortable. Gansie also arranged for my brother and me to visit on our own a lonely old man who lived at the end of a row of little terraced cottages to the left of The Old House on the same side of the road. Gansie was very sociable and loved to have family visitors. She had lots of individual trays with teapots etc. and visitors who stayed at The Old House would get tea in bed first thing in the morning. People used to bring jars of home made jam, home made cakes, etc. to help Gansie when she had visitors. She used to give simple jobs to people who were out of work or down on their luck, and have them in her kitchen for a meal. Gansie also set up the Over 60s Club in the Village Hall (opposite The Old House) where local elderly men played games like dominoes, and she arranged for visiting speakers to come in. The lady who helped clean The Old House was Mrs. Easy. There was a lot of housework involved. Gansie had lots of silver that needed cleaning and I can remember the smell it left. I cannot remember how The Old House was heated but I do remember having stone hot water bottles in bed. Gansie used to ring up her grocery etc. order to the Ayres village shop at the end of the drive and we children would collect it – the money being paid at another time, possibly via an account. With no fridge, the food was kept in a larder, on cool stone shelves and a gauze to the outside as a ‘window’. To the right hand side of the drive was a building that I think housed the car. Behind the house was a large barn which had barn owls in it. I cannot remember what was kept in it. There was a massive orchard which mainly had apple and pear trees, and some plum trees. Gansie used to stew apples which Harry would have for breakfast every day. They stored the fruit picked from the orchard on paper in the loft near the back door, and were able to eat them all year long. Gansie had a short washing line about 2 metres long outside her back door – I think it was not meant to be seen. My brother John and I went by train to Harston in the summer holidays, being met by Gansie at Harston Station. The level crossing had to be manually opened and shut. I remember climbing the trees that are still in the front garden of The Old House. I loved riding and saved up nearly all my pocket money for pony rides at Harston. My parents and Gansie also paid for one ride each. Where the Limes now is, Miss Collins used to have a riding school with a row of stables with horses and ponies. John and I used to help at the stables and sometimes got a free ride. We used to ride along the A10 as it was not busy then, with so few cars that I remember Gansie turning round to speak to us while she was driving! Gansie’s car was probably an Austin, one you had to crank up at the front to start it up.